Tough Tested Driver Earbud w/ in-line mic. coiled cord for safety. Earbuds are new factory sealed. IP dust resistant. ear protection. ear hooks for secure fit. heavy duty. 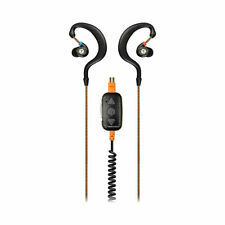 Tough Tested Jobsite Stereo Earbuds w/Mic & Noise Reduction NEW . Condition is New. NEW SEALED IN BOX TOUGH TESTED PROCOMM WIRELESS HEAD SET WITH BUILT-IN SPEAKERS. 10 X NOISE CANCELLING MICROPHONE. CALL ALERTS. Take your favorite music along for any adventure or to any jobsite with the SP45 Rugged Waterproof Outdoor Speaker from Tough Tested. Wirelessly connect it to your Smartphone or Bluetooth enab. Jobsite All In One Heavy Duty Speaker. Condition: New. THE 50 STATES. From the gym to the slopes, the Ranger Noise-Isolation Earbuds with Microphone from Tough Tested allow you to stay active without compromising your phone calls or music. Halo 360 directional mic, Gold connector tip,sport fit shark fin. Designed for fisherman, boaters and outdoor recreation on or around the water. Sport fit shark fins give a secure fit even with sunglasses on. Center button for play/pause/answer/end with most android devices. NEW IN BOX TOUGH TESTED JOBSITE STEREO EARBUDS WITH MIC. HEAVY DUTY. Take your favorite music anywhere with this rugged waterproof outdoor speaker. Wirelessly connect it to your smartphone or Bluetooth-enabled device to start listening to your favorite tunes. You can also take calls with the built-in microphone. Tough Tested Jobsite stereo Earbuds W/ In-Line Mic. Music Equalizer Voice Booster. EQ Voice Audio Technology. IP64 Dust Proof/ Waterproof. Trending at $28.66eBay determines this price through a machine learned model of the product's sale prices within the last 90 days. What's in the Box: Earbuds. Coming soon. Sporting Goods. Condition: New other (see details). This item is new and has never been used. The box has been opened. Reinforced Stress Relief For 10,000 Uses. It has a flashlight and built-in noise cancellation microphone. 10w speaker. Dust proof, waterproof, shockproof. 4400mAh powerbank. Tough Tested Driver Mono Earbuds Safe Driving w/ In-Line Mic. Condition is New. Shipped with USPS Priority Mail. Hello and welcome to our auction! This item is brand new and unused. This should provide you with years and years of enjoyment. Please see included pictures for more details. Also please feel free to contact us with any questions you have. Happy bidding! Tough Tested Driver Mono Earbud SAFE DRIVING environmental noise control. Quality Tested. You can expect a fully functional product. We Have Continually Grown By Providing Quality Deals At Low Prices. This is LIKE NEW OPEN BOX. 100% Original. Built-in microphone. Dual 40mm speakers with extra bass. Built-in microphone. Open Box - Certified by The-Open-Box. The item may show signs of use which may include markings, scuffs or light scratches. Includes all essential accessories for the item to function. New! ToughTested Jobsite Heavy Duty IP67 Waterproof Bluetooth Speaker - New! Driver mono earbud is designed for safe, hands free driving. New York (4.0%). New Jersey (6.875%). You have our promise. Tennessee (9.25%). Utah (6.7%). Pennsylvania (6.0%). Nevada (7.6%). IP64 certified water/sweat/dust resistant. WATER/DUST/SWEAT RESISTANCE: IP64 certified. STRENGTH: Kevlar reinforced cables and heavy gauge wire combine for maximum durability. Center button for play/pause/answer/end with most android devices. Quality Tested. We carefully inspect each used item to make sure have minimal or no scratching. You can expect a fully functional product. We Have Continually Grown By Providing Quality Deals At Low Prices. Coiled cord for safety. IP54 Dust resistant. Ear Protection. Heavy Duty. Earpiece Type: Monaural. Make: Tough Tested. Flexible ear hook. Q: Are Your Prices Negotiable?. Form Factor: In-ear. Dust and water resistant. Driver mono earbud is designed for safe, hands free driving. Dust-, water- & Sweat-Resistant. Tough Tested Carrying Case (Flap) Smartphone, iPhone 6 Plus - Black. FACTORY SEALED. Ergonomic ear-hook offers all day comfort. Choice of 3 tiered tree-style or memory foam tip provides great noise isolation and custom fit. Mono earbud and multi-function in-line control box with Halo 360 mic and volume wheel make operation and sound clear and precise so you can keep your eyes on the road. IP54 certified for water/sweat/dust resistance. You can even use them to answer calls with most Apple and Android devices. Gold connector tip for maximum sound quality. Tangle-proof coiled cord. 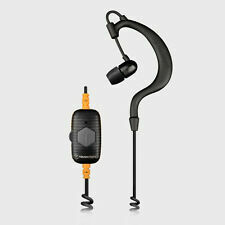 3-in-1 Jobsite Earbud Technology - 'Cause You Gotta Have Tunes! 10w speaker. Open Box - Certified by The-Open-Box. The item may show signs of use which may include markings, scuffs or light scratches. Includes all essential accessories for the item to function.